Aaaaaaaand we’re back. Took a little hiatus. I won’t lie, life got in the way. I took this summer weekend to recalibrate how I gather and share info online. It’s already helping, so I thought I’d share with you. Don’t wait as long as I did. Mark your calendar now for a 1 hour ‘recalibration’ session’ – you’ll be glad you did. First, how to gather and read the internet’s musings efficiently. It’s important to know that Google just shut down Google Reader (*gasp*). If you’re unaware, it was a tool to keep up on the latest news and blogs from around the interwebs. Feedly is the replacement I chose. But there are others. Consider it your personalized magazine rack. There’s a ton of content being produced all day every day and Feedly helps you read exactly what you want to, weeding out anything else. Here’s my current screenshot. I ‘follow’ 61 different sources. Sounds overwhelming…until it’s organized into a single dashboard that I can flip through as fast as my little fingers can go. Similar to Gmail, there are several options for your ‘viewing pleasure’ including straight lists, small icons and large story previews. Nothing feels better than a clean desk. Ahhhhhhh. I’ll admit it. For way to long I was copying and pasting links into Facebook and Hootsuite. Buffer came highly recommended and so far, I’m hooked. 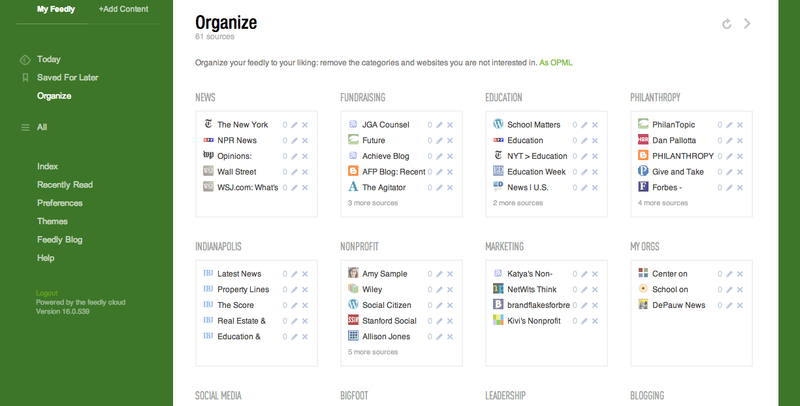 It’s Hootsuite’s scheduling tool on steroids. Connect your social accounts, install the browser button (one-click) and choose which times of the day you want messages to go out. Then, as you scour the web (from Feedly of course) you can quickly share content across your networks. I know this may be old-hat for some, but brand spakin’ new for others. How you use your new gathering and sharing power (ahem, prowress) is up to you. Go get ’em! Next #MCON13 Top 10 and Preview – Win Tickets!! Thanks Nate…. was looking for a good replacement to Google Reader. Keep up the terrific work! Feedly is great, I’ve been using it for awhile now. From a design nerd perspective, I love the UI.